The Bellevue Rod and Gun Club is a private sportsmans club located along the scenic Platte River south of Bellevue, NE. We are a non-profit group dedicated to promoting the shooting sports, fishing and outdoor activities. Several ATA and non-registered trapshoots are held through the year. The "Oyster" shoot is held in late spring each year, and is usually very well attended. At least one ATA registered and one non-registered trapshoots are held each year. Check our Public Events Calendar for more information. Hosting the annual Fishing Expo for Area Special Needs Children. This event brings the opportunity for area special needs children to experience the outdoors in a controlled , safe environment while catching a few fish from one of our two managed fishing lakes. The event is well sponsored and attended by the Nebraska Game and Parks Department, local fire and police department personnel, with fire truck displays, a medical helicopter landing and display The 2018 event is scheduled for September 8th. The club promotes a Wednesday Evening Trapshooting League during the late spring and throughout the summer. Team must include a club member. The Bellevue Rod and Gun Club operates a Fireworks Stand during the 4th of July period. Proceeds from the sale help to support the club activities. 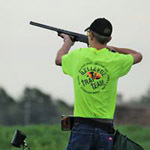 Each year, the Bellevue Rod and Gun Club awards two scholarships to deserving high school trapshooters. Visit our Facebook page for current events and other info about our club.